Just So Posh has a great assortment of personalized gifts for anyone on your holiday list. Everyone loves personlized gifts, they are perfect for holiday gifts. On Just so Posh you will find gifts for everyone! Find great gift for the Kids, the Home, and the Holidays! 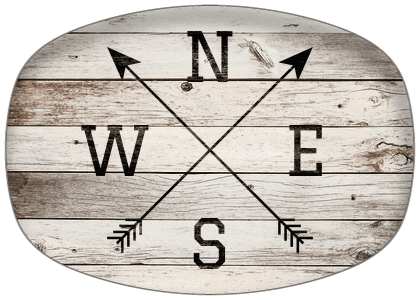 I picked out this beautiful wood grain platter for a family member who loves to travel and had it personalized with arrows showing directions. It makes a perfect addition to their home, which is adorned with all of the travel pieces they have picked up on their trips. It is available in several different washes and can be personalized any way you want. Delivery is quick and my platter came in perfect condition. I will be giving this gift along with some dried sausage and quality cheeses. Personalize this Wood Grain Arrows Platter with your family name, initials, or any text that you desire. There are no personalization fees on this item, and it ships for free! The platter's dimensions are 14" x 10". Free Shipping on Personalizable Beach Nautical Platters at JustSoPosh.com! Free Shipping applies to orders shipped on USA. I like the one you got. They have really nice stuff. It's pretty unique, too. I do too. Its perfect for my recipient.